Though many have doubts that biometric technology will become the prevailing ID technology of the future, replacing passwords and PIN numbers… it’s already being rolled out. In some places, it’s been active for a decade. 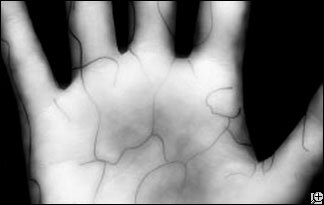 Palm veins are more secure than fingerprints, since they can’t just be lifted off of a surface like fingerprints; and only a living hand can be properly read, since the system depends on properly-flowing blood to work. Also, the system is a tenth the cost of retinal scan technology, considered the gold standard in biometric systems. Palm Vein tech has been used in Japanese ATMs for the past decade, with great success, eliminating the need for easy-to-lose-or-steal PIN numbers. It is now being studied by the U.S. Army to identify individuals for payroll, and other organizations are looking at it to replace barely-effective and very insecure PIN-based systems. And lest you think it won’t hit U.S. shores, the tech has already been rolled out at a school in Louisiana, where students use the scanner to identify themselves to pay for school lunches. There is still a great deal of resistance to any accurate ID technology in the U.S., where many citizens are convinced they will ultimately lose their privacy protections wherever they go. These citizens maintain that biometric tech will never make inroads in the U.S. But they’re not taking two things into account. One thing is the fact that the technology is being broken in with people who are not in a position to avoid it. Army troops and school students must do what their leaders or adults tell them (though, in Louisiana, the parents—not the students—can opt out of the system), so they will soon get used to using the technology. It has been demonstrated, time and again, that once people are used to a technology, they are less likely to resist using it in the future. And breaking the young into technology early makes it a guaranteed lock-in by the time they are adults. The other thing tech dissenters are not taking into account is the willingness of the public to accept a technology, when there’s something attractive in it for them. Take, for example, computer cameras: Years ago, the idea that a camera might be mounted on your computer, potentially watching you while you did—well, everything—seemed insane to even suggest to people. Yet, today, with the advent of free phone services like Skype, and various social media systems, more people have live cameras (and microphones) on their computers and laptops, often on 24/7, than anyone would have guessed. People value the convenience of cellphone technology and the many apps they can use, so they forgo their concern of being trackable at all times. People accept companies storing their personal information and credit card data, so they can make one-click purchases. People will willingly enter minute details of personal data for a one in one million chance of winning a DVR. The public is willing to sacrifice privacy for a good enough incentive; and often, that incentive doesn’t have to be that good. So: Imagine a prominent bank in the U.S. that makes palm vein scanners available to those who use ATMs, offering no banking fees for use. Imagine Starbucks or Best Buy allowing frequent customers to zip in and out, using palm vein tech to identify them and debit their accounts. Imagine a computer game store that allows customers to store data on games they’ve bought or tried, matches them with other online users and suggests new games to them as they are released. You should begin to see how easy it would be to roll out this technology, nationwide, in no time. Personally, with the ever-growing threats to personal security, data protection and financial records posed at every store, ATM and credit card transaction, it amazes me that Americans haven’t woken up to the potential disaster they risk simply by leaving their home every day, and demand better protection of their privacy through better security ID systems. Even now, the government warns Americans that we are in imminent danger of a digital “Pearl Harbor,” an attack on our digital data that could potentially wipe us all out of our data and cause widespread chaos that might not be fully recoverable. But, Americans being who they are, I suppose they won’t act until the digital “Pearl Harbor” actually happens, and citizens lose millions, maybe billions of dollars to insecure and easily-hacked systems. At that point, they’ll be kicking at the doors to Congress, demanding to know where their God-given security is. Previous Previous post: Cloud Atlas: Doomed to fail in the U.S.? I’ve already seen biometrics in use at workplaces. Working as a nurse, I have found that medication dispensing machines have been frequently combined with fingerprint scanners to identify the user. These scanners are much more effective than using passwords, which can be lost or stolen. Security systems by the DoD that require passwords require ridiculously difficult passwords – to the point that users frequently have to write them down somewhere or risk forgetting them. This is another threat to security, a small notebook full of user logons and passwords would make an excellent target for thieves seeking sensitive information. I would much rather log on with a fingerprint or palmprint than with logons and passwords that are easily stolen. I’d much rather use biometrics than my present incomprehensible list of passwords and PIN numbers; My online activities aren’t that extensive, yet I have over a hundred sites that require a password. As you said, why memorize (or store) all of those, when you can have one much more secure ID verification for all? There are such clear benefits to using secure ID systems, especially the ones you mentioned, that it continually amazes me how many people oppose them… though I suspect most of them aren’t thinking things through beyond vague, hysterical “Big Brother” notions.